Cast: Which mistake will I repeat? Eps.1-2: Don't upset the machine, OK? Ep.3: How do we attribute that blindside? Ep.5: Oh, those disruptive puzzles! Ep.7: The annual merge-time power rankings! Ep.9: What the heck was Angela trying to do? 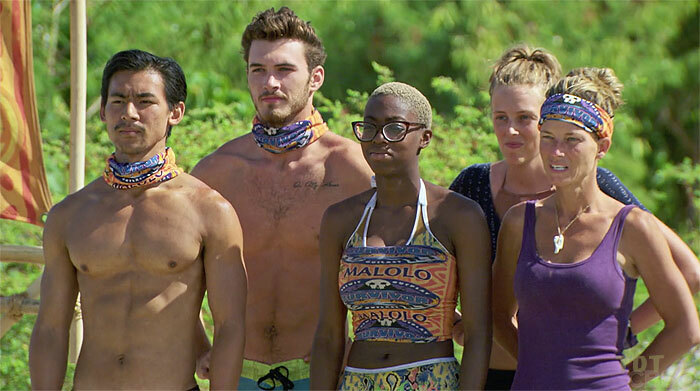 Ep.13: Who still has a chance to actually win? If you’re at least as old as I am, you probably remember a time when bookstores were everywhere, before Amazon and online sellers, before e-books, before Nooks or whatever else made it easy to avoid tangible books. And right around the time that industry changed dramatically because of technology, Harvard political scientist Robert Putnam put out Bowling Alone, an academic book that somehow, some way, sold a ton of copies and seemed to be on display at every bookstore circa 2001-02. In a very general sense, in the book, Putnam explored the loss of community in America. His basic argument was that numerous factors, chief among them television and divorce and two-working-parent households, had contributed to the decline of social connections. The title of the book was a play on how the amount of bowling leagues nationwide was on decline and this, amongst a lessening of civic organizations of all kinds, was leading American citizens to be more insular. In a more specific sense, though—or at least from an academic perspective—Putnam was most interested in the variable/concept/theory of social capital. In the book, and in his earlier work, he discussed two separate types of social capital: bonded and bridged. But before we explain that, let’s define social capital: Bourdieu and Wacquant defined the term as “the sum of the resources, actual or virtual, that accrue to an individual or a group by virtue of possessing a durable network of more or less institutionalized relationships of mutual acquaintance and recognition.” What does that mean? It’s basically the credibility a person or group attains by gaining social connections. The more you have, the better. But, again, it’s a wee bit more complicated than that. We have different types of social connections. There are the strong ones—bonded social capital—that we form with family and close friends. Then there are the ones the weak ones—bridged social capital—that we form with acquaintances who might share similar affiliations or ideologies or whatever. How the heck does this apply to Survivor? Well, get ready for me stretch here. In this episode, we heard a lot about how the game is random, that your initial tribe is not family. But, in a sense, we’ve seen over and over again how players treat it as such. 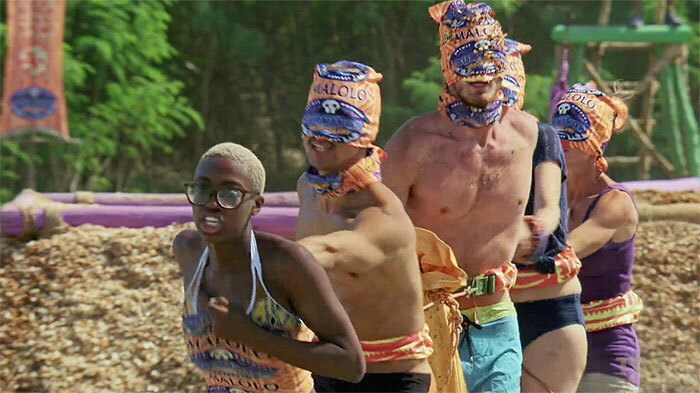 There is almost always an intrinsic value placed on who you begin the game with… basically every season we see people struggle with betraying original tribemates but not later ones. I would argue that explains Angela’s move last week. Oh sure, strategically it made complete sense to stay loyal to the original Naviti given the majority on each of three tribes. But when you’ve been betrayed like Angela, you would think she’d want revenge or understand her place in Naviti (the bottom). But then you hear Angela’s confessional about her child heading to college and her recent divorce, and you can see she is someone searching for social connection. And that, my friends, is why I honestly think Angela voted against James. She views Naviti as her family; regardless of how rational it is, she formed bonded social capital with her original tribe. She liked James. She talked to James. But, in the end, he was a bridged connection, a less-tight bond. When you think about it, in our daily lives, we have both of these types of connections and, when it comes down to it, we almost always cultivate and care about the bonded connections far more. Desiree: We tend not to see much of Desiree. Episode after episode, she kind of fades into the background. But what editors do show us is a woman who’s doing well in challenges (this last immunity aside) and always around to make smart decisions (like going through Stephanie’s bag). I’m thinking she might emerge as a real key player come merge time. Kellyn: Once again, Kellyn looks to be a low-key leader among her new tribe and, of course, the original Naviti. We know she’s great at puzzles. If she can show any skill in those odd balancing challenges Survivor loves post-merge, we’re looking at a very clear contender for the top-three… or even a winner. Michael: I have to admit, I was a bit surprised that Michael wasn’t the one targeted this week. If Bradley was on this new Malolo, I have no doubt James would still be in the game. But, in the end, Michael is still around and we know he’s both a physical and strategic threat. If he can only make the merge, he could become a vital player. The only problem, of course, comes if, post-merge, we continue the Pagonging. Angela: It’s kind of weird: We’ve now seen two episodes basically determined by Angela. She’s clearly been the fulcrum vote twice. So when you think about it, Angela fully led the removal of one-third of the players eliminated so far. That sounds like she’s super powerful. But I can’t remember a less-powerful castaway having so much power early. Can you? Donathan: To me, in what so far resembles a wee bit of a throwback season, Donathan is going to be a throwback character type. I’m not very good at predicting the future (as all of you readers fully know), but don’t you think producers are foreshadowing a Shambo- or Denise-like arc for Donathan? What do I mean? I feel like we’re going to be screaming at the television for Donathan to make a damn move and he just won’t. And he won’t have any chance to win because of it. 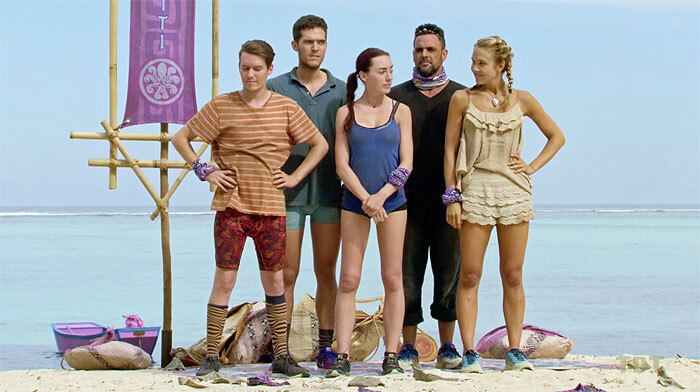 Domenick: In my pre-season cast assessment, I have Domenick as one of a few that I thought can’t win the game. I also put Donathan, Bradley and Angela in that category and those predictions look great to me. (I also put Michael there and I might be wrong.) 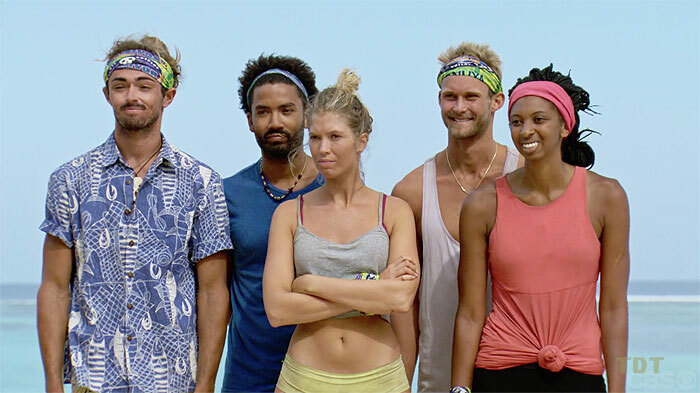 But, I will admit my mistake: Domenick can win this game. I still don’t think he will because he’s played way too obviously too early, but there’s a chance, and as each episode goes by, I find myself liking him more and more. Bradley: I am looking forward to Bradley’s imminent elimination more than I have very few before him. We know it’ll be a blindside based on editing. And it’ll be amazing. And I will be happy. Chelsea: Well, she got a little screen time this week, but the quicker we say bye to Chelsea, the more time we’ll have with some of the bigger players. Libby: Editors clearly want us to know that Libby will make a Big Move™ soon. I mean, first Morgan’s pre-exit speech and now this whole monologue from Domenick? That, in the storytelling business, is what we call foreshadowing. Libby will make a move, we’ll all enjoy it and we’ll have to wait and see if it’s really as Big as producers are trying to hint. Jenna: I was going to write here that I hope Jenna is in trouble if Yanuya loses because if she’s not, it might be my lone remaining fantasy choice (Laurel) in trouble. But then I remembered Chris is on this team, so they won’t ever come in last of three. 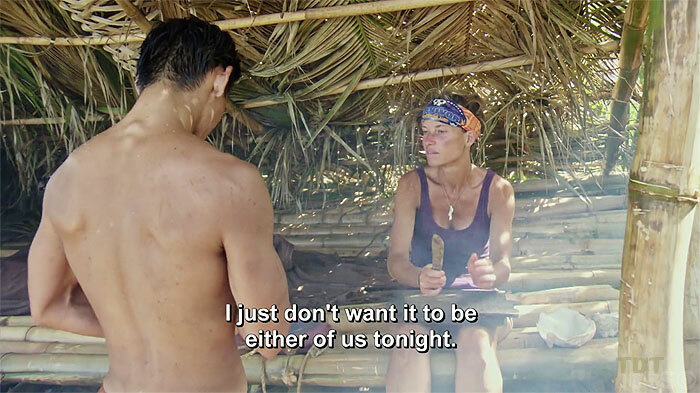 With that said, Jenna is another castaway that I can’t put a finger on yet. She doesn’t seem to really be playing, but I also think she might have it in her to make a move. Sebastian: Still. Cannot. Seem. To. Like. As. A. Player. And. I. Think. It’s. His. Voice. Sorry, Sea-Bass. Laurel: And my Winner Pick™ keeps trucking along. If she can somehow make the merge, her alliance of sorts with Wendell and her clear connection to Donathan might make her a real player. And that would be a first for a pick of mine. Wendell: Of all the original Naviti, is anyone in a better position than Wendell? His play seems all about making real social connections. He’s done it with his whole original tribe and they all talk to him, seemingly. And he’s made connections with others also. I really like his spot right now. Chris: I don’t think Chris has any chance in hell of winning, but, holy crap, his performance in challenges is downright amazing. Forgetting everything else, let’s give him huge credit for that this week. And with that, let’s call it a week and hope this coming episode features a surprise and not another former Malolo heading to Ponderosa (not the horrible 80s “restaurant”). Pat Ferrucci started watching Survivor when episode two of Borneo first aired. He's seen every episode since. Besides recapping here, he'll be live-tweeting this season from the Mountain Time Zone. Why? Because nobody cares about the Mountain Time Zone except when they want to ski. Follow him @PatFerrucci for Survivor stuff and tweets about anything and everything that enters his feeble mind.